The 16th Epcot Internation Food & Wine Festival returns to Disney World on September 30 and stays for 45 fun & food filled days through November 13, 2011. As always each year brings several new tastes to enjoy along with many of your old favorites. Again you will see over 25 international marketplaces set up around Epcot's World Showcase featuring tapas-sized portions of dishes that represent each area paired with beer, wine, and even cocktail selections. Since Disney World is building its first resort in Hawaii (Aulani) it only makes sense that Hawaii is represented at the Food & Wine Festival. The special culinary treats you will find include: Kalua Pork Sliders, Tuna Poke with seaweed salad and lotus root chips. Also you can pick up a Seven Tiki Mai Tai or a Kona Longboard or Pipeline Beer to really feel like you've escaped to the Hawaiian Islands. If after visiting the new Hawaiian Marketplace still has you longing for more of that tropical feeling you can head to the new Caribbean Islands Marketplace. Here you will be able to sample: ropa vieja with rice and jerk-spiced chicken with mango salsa. The beverage menu will entice you with a frozen Dragon Berry Colada and frozen Rock Coconut Mojito. Portugal will not be outdone with the addition of a new Portugal Wine Bar where you can enjoy the wines with calamari salad with olives and smoked paprika. Returning back to the Epcot International Food & Wine Festival this year will be the Scandinavia marketplace which will feature a fresh new Xante Sunshine cocktail made from Xante pear and cognac liquer. If you enjoy watching the cooking shows on television then you may want to make sure that you catch some of your favorite celebrity chefs when they appear live at this year's Festival. Some that are appearing this year include: Jeff Henderson, Cat Cora, Alan Wong, Gale Gand, Suvir Saran, Jamie Deen, Rock Harper, Celina Tio, Robert Irvine, Andrew Zimmern, Buddy Valastro, Warren Brown, Art Smith, Keegan Gerhard and more. Believe it or not you can also see a cranberry bog at this year's Food & Wine Festival. Presented by Craisins, it tells the story behind the agricultural heritage of the cranberry. The Eat To The Beat Concert Series again returns to Epcot with 3 shows performed nightly at the America Gardens Theatre with a great line-up of musical guests including first time appearances by: The Pointer Sisters, The Gin Blossoms, & The Orchestra featuring members of ELO. The concerts are FREE with your paid admission to Epcot! •The Festival Welcome Center, with a Wine Bar, Authentic Taste Seminars, Authors Without Borders weekend conversations and more. •More than 270 chefs including Disney chefs and culinary stars from across the country conducting culinary demonstrations and hosting dinners and tasting events. •A complimentary Marketplace Discovery Passport to be stamped at each international marketplace visited for the perfect scrapbook souvenir. •Popular returning events that include First Bites Opening Reception on Sept. 29; Kitchen Memories (formerly Celebrating Family and Friends in the Kitchen); Mixology Seminar; and “3D” Disney Dessert Discovery. •The weekly Party for the Senses grand tasting event beginning Oct. 8 and with a new Saturday evening time of 7:30-10 p.m. featuring tempting bites from eminent chefs, more than 50 wines and beers and live entertainment presented by Cirque du Soleil. 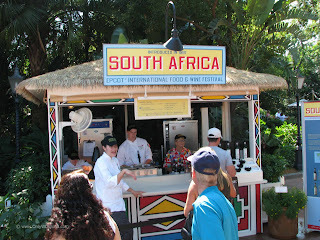 1 comments to "16th Epcot International Food & Wine Festival Welcomes New Tastes"